Almost 4,000 school children on Ambae in Vanuatu are still out of their classrooms for over a week after they were forced out by the rumbling Lombenben volcano. A total of 3,687 school children are displaced following the mandatory mass evacuation order, the Education Cluster Team revealed. 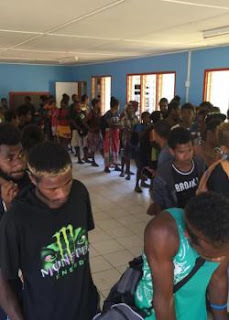 481 Early Childhood Care and Education (ECCE) children, 2 669 primary and 937 secondary students are scattered on different islands of Maewo, Pentecost and Santo without the Ministry of Education and Training (MOET) knowing their whereabouts. A total of 283 are final year students while 654 are non examination years, being year 7, 8, 9 and 11's. The MOET is struggling to get details of the whereabouts of each student, at the same time making arrangements to get them back into the classroom as soon as possible, especially the final year students who will be sitting mock exams this week. According to the MOET, final year students will be relocated to schools on Pentecost such as Gambule School and Ranwadi and on Santo. Year 10, 12 and 13 students after enrolling to schools on Santo should report to the Principal Education Officer (PEO) or the MOET. School principals, education officers including teachers, parents and guardians on Maewo, Pentecost and Santo are urged to report on the whereabouts of students. The MOET said it will be rolling out the early childhood fee tuition in kindergartens and year 7 in the accommodating schools. Last Friday, the Minister of Disaster Management, Ham Lini, on the advice of the National Disaster Committee, instructed the MOET to waive school fees in 3rd term of 2017 and 1st term of 2018 for Ambae parents.